Despite your investment in high quality content marketing, do uninspiring results leave you without an explanation beyond Facebook’s organic reach falloff? Not sure how to stand out in the endless steams of information and messages reaching your audience through a variety of channels and devices? Then try interactive content. It’s content marketing superglue for visitor attention. Yields a broader audience including the potential for new untapped segments. Keeps visitors engaged with your content marketing yielding better conversions. Allows for more tailored post-engagement experience improving results. Almost 50% of marketers currently use interactive content in their content marketing mix and that number is expected to grow to 80% next year according to Content Marketing Institute research. 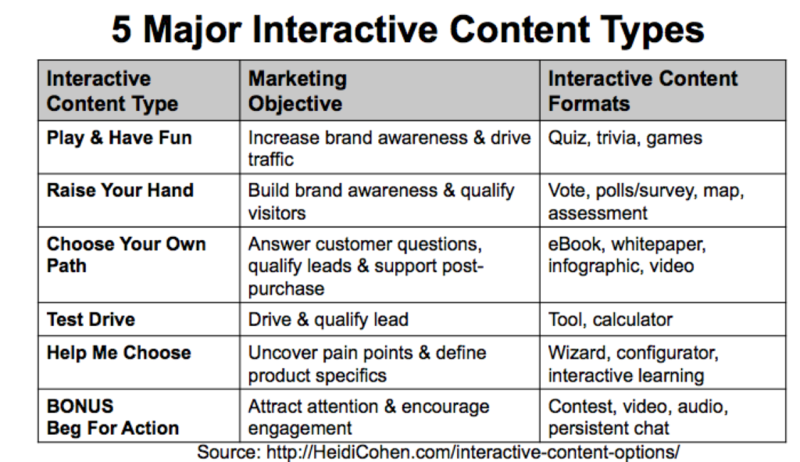 Additionally, interactive content is one of Rand Fishkin’s 10 key forms of content for SEO. As such, it should be part of every marketer’s long-term content strategy for optimization and findability. Don’t you think it’s time to start testing this growing content format? Before impulsively jumping in assess which interactive content options fit best in your content marketing strategy. 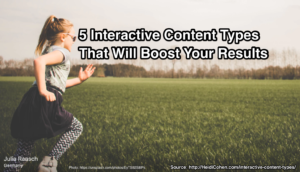 To determine which type of interactive content types works best for your audience examine these 5 major options. Determine how you can use them to support each step of your buyers’ journey while providing the information they actively seek. The Play and Have Fun Interactive Content Type includes games, quizzes, trivia and brackets. At its best, this interactive content makes information entertaining and engaging. Targeted at the top of the purchase funnel, this interactive content option builds awareness and drives traffic. It expands your potential audience by attracting new prospect segments. 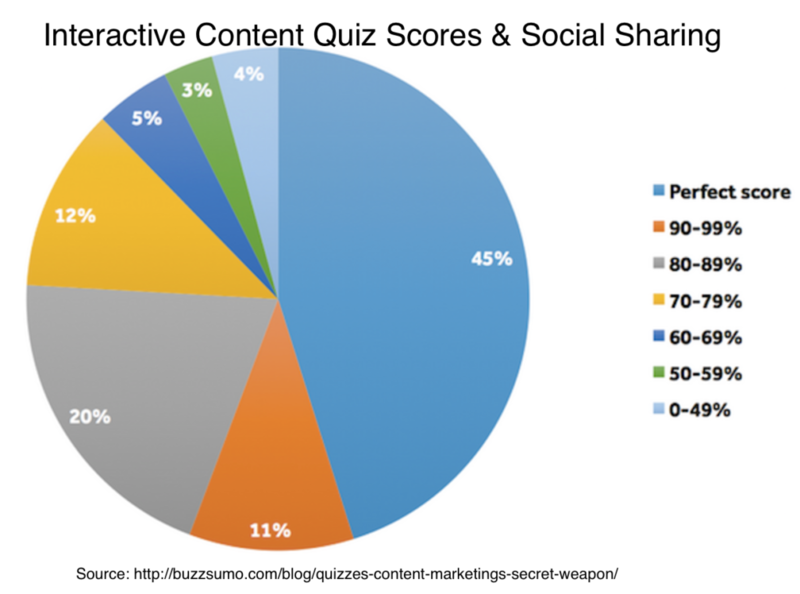 On average, quizzes attract 1,900 views according to BuzzSumo and Qzzr research. Graded quizzes test knowledge yielding a score showing reader smarts. As a result 76% of participants scoring in the top 20% share their results on social media, generally to Facebook. Outcome quizzes (like the old Cosmos quizzes) undercover personality traits and are more popular. To increase quiz results, try these 2 counter-intuitive suggestions based on LeadQuizzes’s analysis of 2,500,000+ leads that yielded 50+% quiz lead capture rates. Ask 10+ questions. 70% of LeadQuizzes top performing quizzes asked more 10 questions. Place the lead capture at the beginning of the quiz. But note the top performing quizzes included prize draws. So test your quiz first. 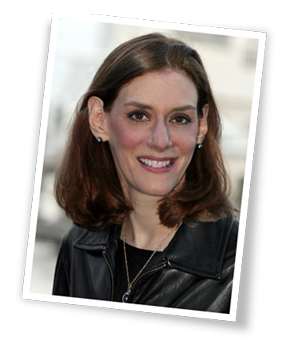 Still not convinced about Play and Have Fun Interactive Content? BuzzFeed is using quizzes to increase engagement while its static content engagement is sliding. 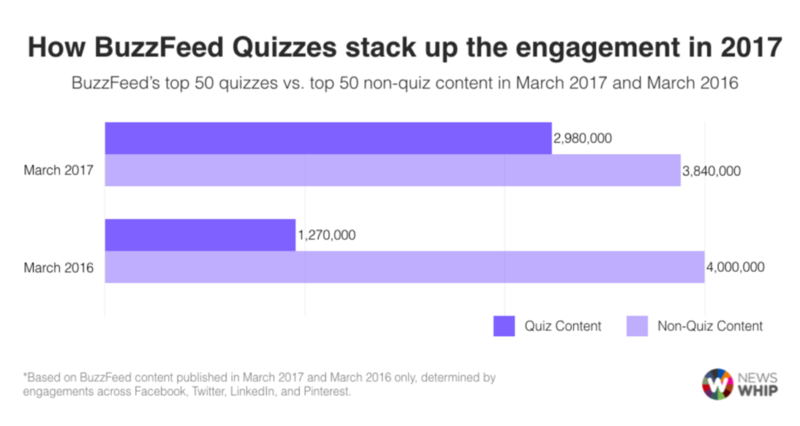 Specifically, its top quiz content engagement increased 135% since 2016 while it’s non-quiz content engagement decreased 5%. While many entertaining quiz examples are consumer-oriented don’t let that deter you if you’re a B2B marketer. Brainstorm fun B2B ideas and give your copywriters or content creators the freedom to have fun. As the name implies, this interactive content type encourages readers to show their opinion through polls, surveys and voting. In the process. the Raise Your Hand Interactive Content option builds awareness and qualifies visitors. 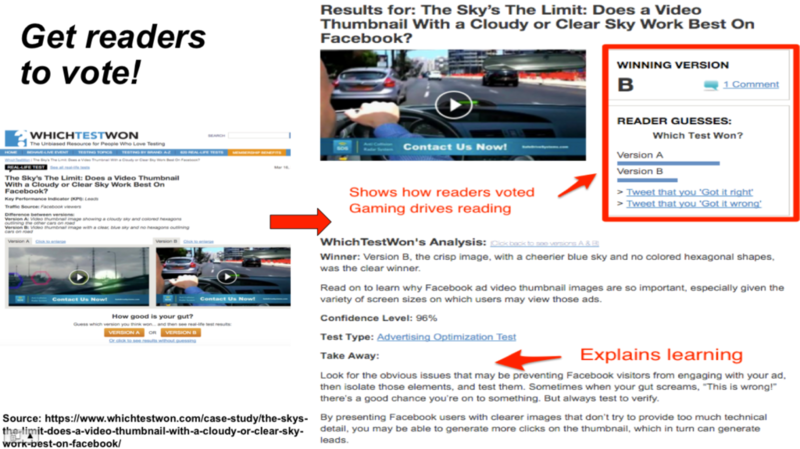 My favorite Raise Your Hand Interactive Content example is Behave.org’s Which Test Won. Targeted at marketers through both their emails and website, the test offers readers a choice to determine how good their gut guesses really are. It’s a brilliant combination of case studies and interactivity. The email arouses reader interest with the subject line. While the website landing page describes the test, KPIs and 2 options. As a result, you want to see if you’re right. The next page contains the correct answer with the case study while showing how you and your peers did. They even let you tweet your results. From a marketing perspective, Behave.org increases pageviews per visitor. Using similar functionality, assessments allow visitors to test their knowledge in a way that’s closely aligned with potential purchases. Depending on the marketer, assessments can be used higher up in the funnel or further down the process. The Choose Your Own Path Interactive Content type provides useful for how-to and educational information at every point in the purchase funnel even post-purchase. It includes maps, ebooks, whitepapers, microsites, infographics, lookbooks, and videos. Visitors can take different journeys through your content and the information changes based on the user’s decisions. Some Choose Your Own Path Interactive Content such as interactive videos are most effective with new content created directly for interactive presentations. The key to success is to understand your target audience and enabling them to jump between your different story lines. 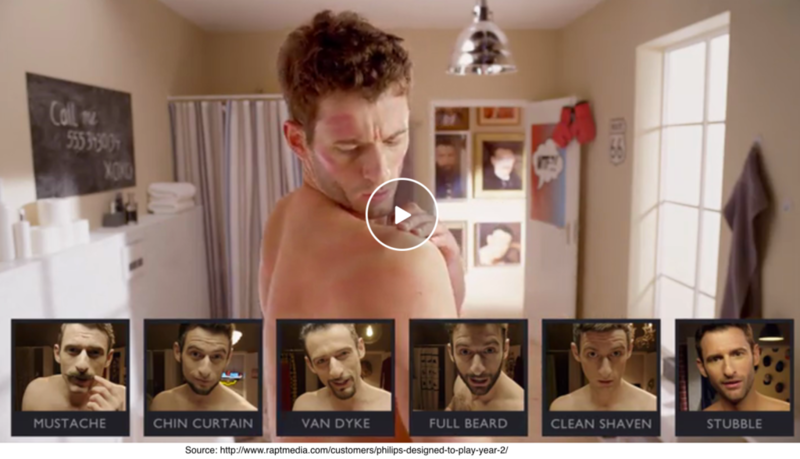 Phillips Razor “Designed to Play” video is a great example. Their goal was to reach the hard-to-find hipster demographic and raise brand and sales metrics. This fun, engaging content garnered 4+ mobile minutes of viewing and increased sales. From a budget and existing content perspective, Choose Your Own Path Interactive Content can tap into existing content and transforms it to attract visitor engagement. This works well with existing big rock content like ebooks, white papers, and PDFs. The Test Drive Interactive Content Type offers “pay-it-forward” utility to visitors with calculators, graders and tailored offerings. 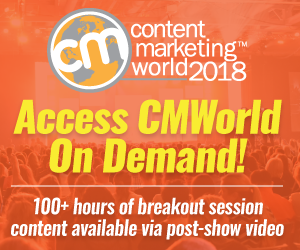 This middle and bottom-of-the funnel content showcases your offering with free tools that provide value to your audience. Tools are a great form of interactive content that brings your audience back to your site. To improve reader results, extend interactive content utility to further engage your audience by adding additional and/or upgraded content. Popular marketing tools that fall into this category are CoSchedule’s Headline Analyzer and Hubspot’s Website Grader. Calculators are another Test Drive Interactive Content Type that helps convert visitors. At their best calculators help qualify leads. 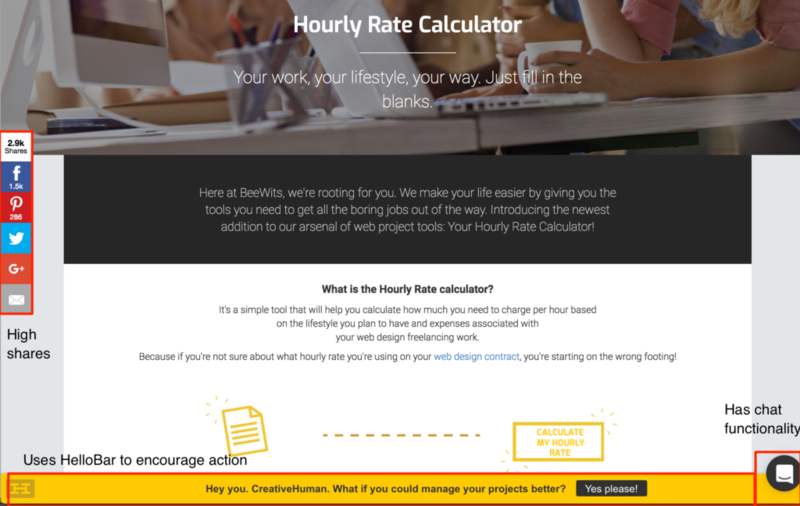 Depending on the focus of your content, they require visitors to invest time to answer your questions such as BeeWits’s highly successful freelance calculator. It has 19 fields! Beyond freelancer attention, this calculator received press mentions amplifying its reach! The Help Me Choose Interactive Content option supports bottom of the funnel and post-purchase visitor needs. It includes configurators, wizards and interactive training. These tools are often created internally to integrate with other systems. It’s most useful when it uncovers user pain points and defines product specifics. It can reduce sales time and costs since prospects assemble specific product elements. While this content type is static at its core, it feels interactive because it pulls users in to engage with it. As a result, it provides key interactive content benefits often with less investment. By their nature, content formats like video and audio need user engagement to maximize the experience. Visitors spend longer times with the content but don’t necessarily engage with the content directly. 2006 DoubleClick Research revealed that online video ads yielded almost twice the click-through rates of static digital ads and viewed 2/3s of the video. 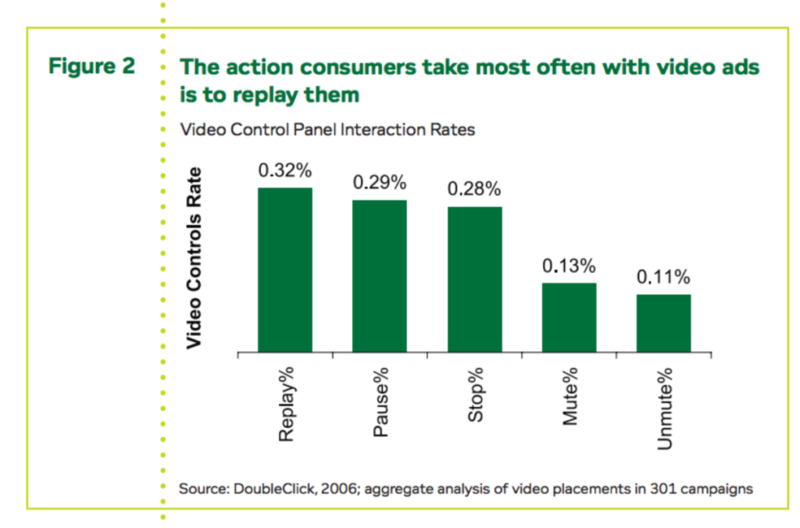 This applies to increased video content marketing content and consumption across platforms. While most video isn’t interactive, viewers use presentation features such as replay, pause, stop, mute and un-mute to improve the experience. Incorporate video and audio into your content mix to increase content consumption even if it’s not interactive. Static infographics also encourage visitor interaction to scroll through the content. Use these formats at every point of the customer journey to encourage ready action. Additionally, contests and persistent chat require user-directed engagement. As top-of the-funnel content, contests attract new visitors who exchange their information for a chance to win a prize. This is particularly useful for building your housefile. Depending on your prize, you can segment your list without asking for more information. I love how Drift talks to me. 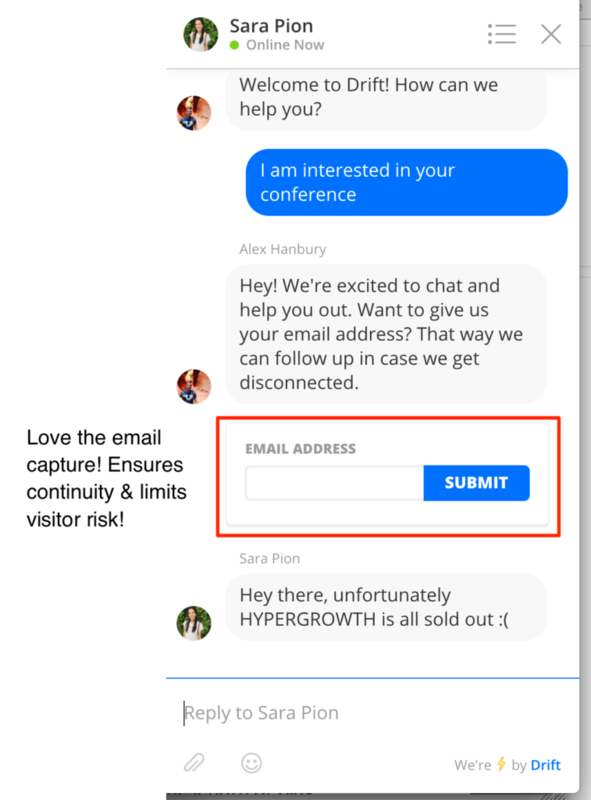 Drift’s persistent chat pops up and can be closed. 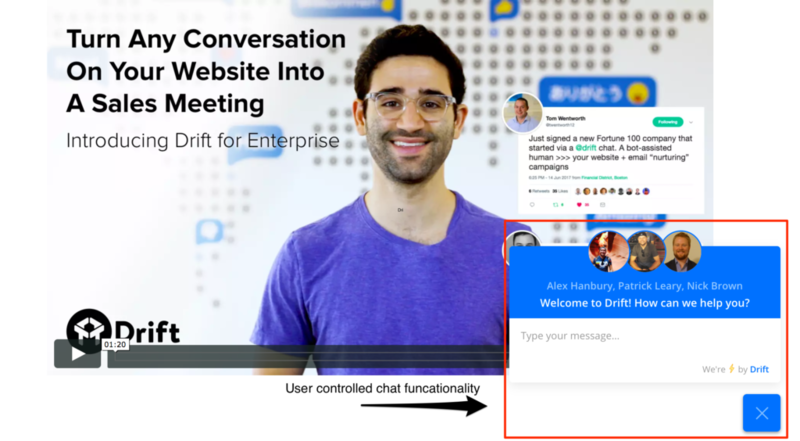 Drift Chat allows real people to respond in real time to unplanned questions. Integrate interactive content options into your content marketing plans to attraction and hold visitor attention for your message. Otherwise your carefully crafted content will yield insipid results guaranteed to disappoint both your boss and your sales team. Instead win your audience over with engaging interactive content that draws visitors in. The key factor is choosing the right topic and providing useful information based on your target audience. Start with top of the funnel options to test this new content format and gain knowledge of what works best for your audience. Even better, get your sales team involved in the process to work together to attract quality leads. Tags BeeWits, Behave.org, BuzzSumo, Content Marketing Institute, CoSchedule, Drift, Hubspot, Interactive Content, Lead Quizzes, Qzzr, Rapt Media. Bookmark the permalink.